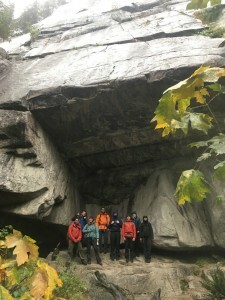 On September 8/9/10 a group of 8 eager & excited VOCers headed up to Squamish to participate in the (not so dry) dry school of G2 lead by our enthusiastic instructors Heather and Raz. 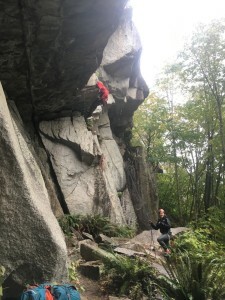 Due to the rain and the interests of the group – it was decided at the pre-trip that the most efficient and valuable way to run the course would be in Squamish, mainly at the Bluffs, going through rope systems: descending (rapping), ascending, and hauling. Upon seeing the weather forecast and realizing seeing a glacier meant a lot more hiking and a lot less learning, everyone was on board with foregoing a glacier classroom. The next morning we woke up, had some breakfast and went through a few more details of the day, questioned Heather some more about glacier travel and headed to the Adventure Centre for coffee. After some car faff and some knot refreshers we were off to the bluffs! Note: most definitely this was not an “alpine start” morning. Once at the bluffs we went through various anchors and then headed over to the electricity tower area rings to start setting up rap systems. We covered many variations to rapping and why you would need them/when you would use them. Heather and Raz decided the theme to the day would be “asking why” which really got us to realize all the things we had done on past trips just “because someone told me to do it that way.” This was definitely a good eye-opener for people (or at least myself). Raz joined us towards the end of the rappelling lessons (and brought timbits! yay car camping!) and we finished off with some top-belay lowering systems. We then broke for some quick food and coffee in Squamish, and went back to the Bluffs for hauling. Here we were taught (with a very simple and beautiful demonstration) about mechanical advantages and different systems. We then split into two groups and started a rescue scenario – starting from someone being lowered and all the way to them being back at the anchor. 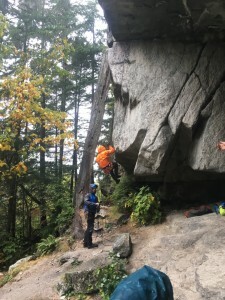 Our group was convinced by Raz to let a rescuer rap in, only to realize that we without him ascending out – we were a little confused by the way the rope systems worked out. Nonetheless we got both out and everyone was saved! Hungry and feeling satisfied with what we had learned for the day we decided to debrief and head back to the cars. Following our debrief we also decided pizza was definitely a good idea, so we headed back to the campsite & got settled. Our plan was originally to have some pizza then do some ascension on a 25m rope set up by Raz earlier, but things didn’t quite work out like that. Following pizza and once it was getting pretty close to midnight we went to check on Raz and Heather who were setting up (at this point we had also been waiting over an hour and a half) and learnt someone had cut it down earlier in the day! The two tried to fix it but unfortunately got side tracked….so we all finished pizza and a few more beers and headed off to bed. Sunday morning we got another ‘Squamish Alpine Start’ and went to the Adventure Centre to look at some examples of various mechanical advantage systems. After some fun puzzle solving we went over our answers and started on route finding with the aid of google maps! After a bit of debating and a quite a bit of knowledge provided by Heather, we felt ready to get back to the Bluffs and start on ascension. We headed to Zombie Roof and set up a few hangers, then divided into rope teams and got roped up for some ‘glacier traverse’. In two groups we each set up a hauling system and got our ‘fallen climbers’ out of the crevasse! This allowed us to better practice transitions and stimulate a rescue as best as we could without an actual glacier. 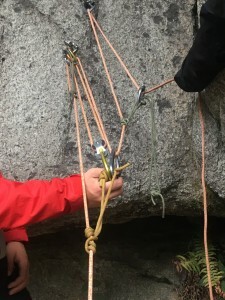 As Raz and Heather went around to laughing crack and pixie corner to set up ropes for ascension we began practicing with different systems and how we could move from one (say a 3:1) to another (say…a 15:1?). Picture 1: a 15:1! See if you can figure it out. Built by Corey, Zander & Julia. After a bit we all got to take our turn ascending and getting a little soaked from the rain & lack of roof that we had to move from out of. Though we mostly practiced with an ascender and micro traxion, we discussed different methods that could be used assuming you had neither of those things. After feeling sufficiently wet and stuffed with knowledge it was time to head to get coffee and take down the tents to begin our trek home. S/O to Zander for all of the pictures! 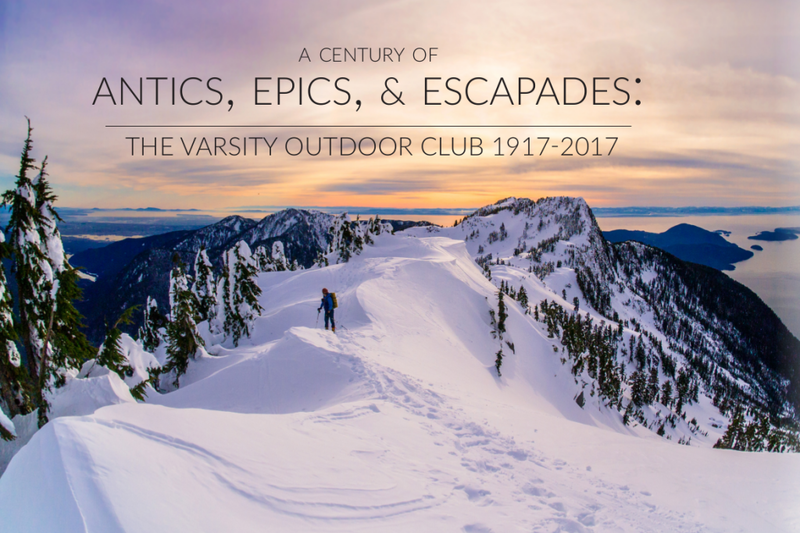 This entry was posted in Trip Reports and tagged Glacier, instructional, Squamish. Bookmark the permalink.